Type automatically on keyboard with Auto Typer Software Utility. Download & try out this keyboard automation software for free and automate typing on keyboard. 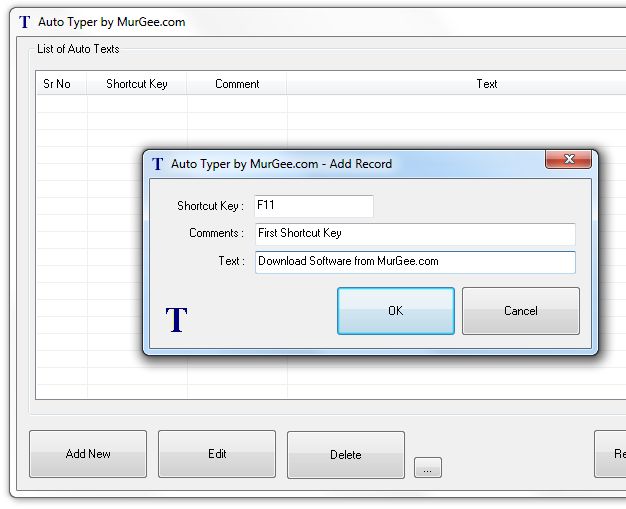 The Auto Typer Software allows to store long sentences in the software and to every sentence you can assign a Keyboard Shortcut key. This can be really useful when you have to type in some predefined long sentences multiple number of times. All you need to do is download the Auto Typer Software, Install & Launch it. The Main Interface of the software provides a buttons to add, edit and remove the long sentences. To start with, click on the Add New button and follow on screen prompts. The Add New Screen of the Software will allow you to define the sentence which you want to be typed onto the keyboard, a keyboard shortcut key combination and optional comment. Click on OK to dismiss the Add New Screen and that’s it. Now onwards whenever you press the shortcut key assigned to the long sentence, the software will simulate keyboard typing onto the keyboard.